Today’s HVAC systems have evolved into sophisticated electronically controlled systems. The days of doors inside the temperature control assembly being controlled by pull cables and vacuum motors are gone. Electronically controlled actuator motors now operate the temperature control doors. They travel as short as 90° and up to 180° rotation. They can move in 1° increments providing heating and cooling changes on demand in single degree increment changes. This means the actuator motors are moving constantly to accommodate temperature setting and mode demands. The actuator motors are essentially duty cycle demand for HVAC climate control to maintain temperature, mixing inside/outside air and floor/defrost/vent distribution all at the same time. The actuators are designed with plastic housings with nylon gears rotated by a small electric motor controlled by a printed circuit board and position potentiometer. These tend to be somewhat fragile. Gear strip and circuit boards burn out, particularly when debris in the duct-ways causes the air doors to stick. Most units are not sealed so they pull in dust that coats the inside and contaminates the lubricant. This results in wear to the motor, gears and potentiometer contacts. 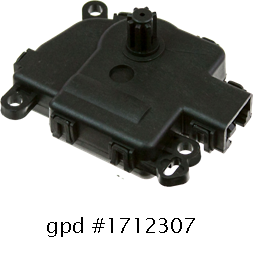 gpd actuator motors are improved by using higher strength nylon gears coated with superior lubricant, heavier duty motors and redesigned circuit boards to prevent burnouts. All units are precision replacements that mount in the existing position without modification. 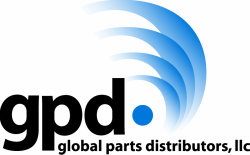 All gpd actuator motors are plug and play and do not require any programming. 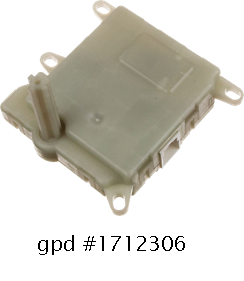 The gpd actuator motor design exceeds the design of OEM motors. The design has been life cycle tested in excess of 10 thousand hours. gpd actuator motors will provide a more durable service life in the HVAC temperature control system.